On January 11, 1865, 150 years ago today, two companies (H and K) of the green 189th New York from the Second Brigade, First Division, Fifth Corps, Army of the Potomac, were sent south down the Jerusalem Plank Road on a foraging expedition. 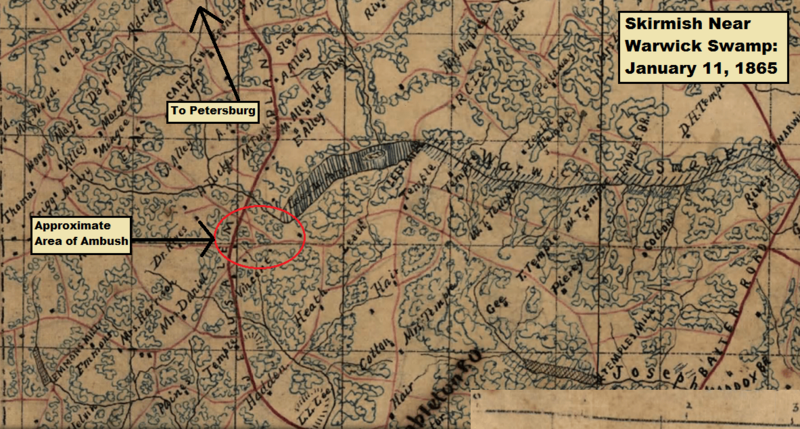 While out, and a mile away from the plank road, the 240 man force was ambushed by Confederate guerrillas, who wounded expedition leader Captain Burrage Rice. Despite the death of Captain Rice, the foraging expedition had been a success when judged by the object of its mission when it set out on January 11, 1865. The Federals continued to get stronger while the Confederates saw desertions steadily increase as supplies ran low and events deteriorated in the rest of the Confederacy. The end was in sight. It was just a matter of when at this point. OR XLVI, P2, pp. 96–97: Samuel W. Crawford to Seth Williams et al. January 11, 1865.